The pathogenesis of TPLF hate towards Ethiopian People and its Remedy! TPLF (Tigray People Liberation Front) from its inception 1975 was based on hate than principled conviction. The pioneers were young delusional students who dropped out from university for variety of reasons. Their orchestra led by none other than Sebhat Nega, whose role was to facilitate Eritrean Separation from its mother Ethiopia. The yolk of the TPLF was based on hate and false history to legitimise the struggle against Central Ethiopian government. Most were full or part from Eritrean origin who believed on “superiority” of the Italian colonised Eritrea on the rest of Ethiopian People. They were cultivated and trained by EPLF (Eritrean People Liberation Front, aka Shabia) for this aim. Most Tigreans youth were recruited through a propaganda of hate against their brothers of Amharic speaking Ethiopians. They were told fictions as make believe. They were instructed in “Stalinist” approach to address the “problem” they encounter from the rest of Ethiopia. In their first manifesto, the first line start with hate towards Amharic speaking Ethiopians, coning it as number one enemy than the usual Capitalism and Imperialism. In the early days, most Tigrean people considered them as bandit rather than freedom fighters. They fought them bitterly. Unfortunately the then government Dergue approach of the war and misadventure led most Tigreans to question Dergue which paved the way to TPLF “victory” among Tigrean youth. Most youth joined TPLF arm struggle under coercion and also Dergue’s failure to engage them. TPLF fought bitterly through its wicked trick against EDU (Ethiopian Democratic front), EPRP (Ethiopian People Revolutionary party) and others local groups which had democratic questions as priority than nationality issues. This was partly to pave the way for Eritrean separation. Dergue had never considered TPLF as proper force till the last two or three years. Its focus was in Eritrea, and its well trained army was based there. This paved the way for the TPLF to jump like monkey in most provinces of Tigray. TPLF supported EPLF when it was strained by Ethiopian army famously in Red Star Military Campaign 1981/82. The current chief of staff (Samora Yenus) fought against Ethiopian solders in Eritrea. TPLF learnt the reality that by claiming Tigray, it cannot survive in an old settlement land with no proper resources which remain dry farms; it had to acquire the bigger Ethiopia. It has to come with New formula; to be the new ruler of Ethiopia (which doesn’t include Eritrea). The method they studied seriously include Italian colonization and Stalin approach. They learnt that as minority to rule Ethiopia, the majority has to be weakened and divided. Their target was the Amharic speaking people, the Orthodox Christianity, the intellectual which were the proponent of Ethiopian nationalism. The rise of Legese Zenawi (aka Meles Zenawi) in power match with this new thinking and practical approach. He led successfully to get rid off his opponents in the TPLF and controlled the yolk of TPLF with Sebhat Nega’s and Eritrean origin TPLF fighters support. The wicked cerebral Meles outsmarted his colleagues and convinced them for the establishment of MLLT (Marxist Leninist League Tigray) which controlled the political, administrative, economic, and military wing of the force. The dollar they earned from Bob Geldof’s “we are the world” “Do they know Christmas?” through deception used to shop armaments, build their MLLT structure, at the expense of dying hundred thousands of Famine affected Tigrean People. TPLF managed to form EPRDF (Ethiopian People Revolutionary Democratic Front) using its Amharic and Oromoffia speaking departments, most of them are solders who surrender during the war to EPLF and remnants of old EPRP named EPDM (Ethiopian People Democratic Movement). TPLF convinced them through fear and coercion to change EPDM’s long held stand on the priority of the struggle to be nationality/ethnic issues than democratic system. Dergue’s brutal regime, failure to democratise the country and engage the people to inform and unite the rest of Ethiopians to defend from EPLF and TPLF made the journey easy for both EPLF and TPLF. Dergue’s high ranking bankrupt military Generals and the enemies obliteration of the system paved the way for TPLF to success. TPLF/EPRDF’s first and foremost aim was to legitimise the Eritrean separation through “referendum” and recognition as independent country. It also made sure no Ethiopians or Eritreans come across to this. The Amharic speaking people which accounts a third of the nation was the only “ethnic group” which was not represented in TPLF’s July conference 1991 after they controlled the Capital city. ANDM (Amhara Nation Democratic movement)at that time was not fabricated from EPDM. The other uniting entities, the Orthodox Christian religion had to be hit; its patriarch was forced to flee and a new “patriarch” of TPLF sympathiser (member) was appointed. The intellectual had to be also hit as they were noted to be an obstacle to TPLF agenda. The 42 AAU (Addis Ababa University) professors were dismissed overnight by TPLF. TPLF faced resistance from late Ethiopian first surgeon, Professor Asrat Woldyes’s AAPO (All Amhara People Organisation)which was established to stop the killings of Amharic speaking people which was orchestrated by TPLF. The well respected professor was thrown to jail, denied medical care and left to die (released for overseas medical care once TPLF made sure he was dying). The OLF (Oromo Liberation Front) which was part of the transitional government was initially a tool for TPLF in distancing Oromo people from the rest of Ethiopian people, mainly Amharic speaking people. It was also kicked by TPLF partly its acceptance by Oromo speaking people in Ethiopia and its fault. OLF should have stayed in the transitional government and defend the TPLF’s hate against Oromo and Amharic speaking people. OLF’s departure from transitional government gave TPLF unparallel power to rule in Ethiopia. Although there were few free and private presses operating in the main Capital city, it was mainly for western consumption. The journalists were sent to prison whenever they write sensitive topic against TPLF. The 1997 Ethiopian Election was a milestone in Ethiopian history. TPLF was deluded and believed that the people would elect it. It freed some access to press and free demonstration (famously Ginbot 7 peaceful demonstration). It was also to satisfy the Western nations which were supporting the regime to their occasional “advise”. The outcome was different story, Kinjit and other opposition fronts gained significant election victory which could give them the mandate to form government. TPLF declared state of emergency and stole the election outcome mainly in the rural part of Ethiopia. It declared itself as winner. That public outburst which led to the June and November 1997 uprisings which TPLF brutally stopped it by massive killing, imprisonment, torture, harassment and majority opposition leaders’ arrest. The distant light that was seen briefly was dumped by TPLF and it presented itself as wounded Tiger for the next 10 years. It destroyed all press, legitimate opposition parties and non governmental agencies which would contribute in the mass teaching on personal, democratic right and good governance. TPLF used its rubber stamped parliament law to stifle any form of democratic exercise in the country using its famous Anti-terrorist law/Proclamations. TPLF attempted to destroy the legitimate educational system and formed its own, generation killing curriculum. It published newly made history books which attempt to destroy Ethiopian independent and sovereign history and its heroes. School was used as propaganda field. Despite that, the new generation born and raised in the last 25 years of TPLF’s brutal regime have started resistance against TPLF minority rule as we noted in most part of Ethiopia, specifically in Oromo and Amharic speaking regions. In the last 25 years, TPLF controlled the military, the economy (through Effort), security, communication and all part of society through force, intimidation and harassment. The famous 1 to 5 controlling system paralysed the public for years but now the youth started to break the chains. Failure of the different ethnic, religious and political group to understand TPLF’s system of rule, mainly raising one against another. Ability to use “Stick and Carrot policy”. Those who dare to stand firm were given stick ( arrest, killing, harassment etc) and those who wanted their daily bread and money by betraying their people were given “Carrot” in from of land, money, business etc. The new generation has understood this and continued its resistance despite merciless killing, imprisonment, fire setting, genocidal propaganda orchestrated by TPLF gangs. TPLF is an anti democratic, elitist group which doesn’t represent the mass Tigrean people. It shied itself under Tigrean people and put itself as legitimate Tigrean people representative. The Tigreans in Tigray live under fear and double oppression, they are not allowed to say anything except supporting TPLF. Those who live outside Tigray and in Diaspora, most benefited from the system and defend it. They make every effort to sustain TPLF’s rule by hook or crook. 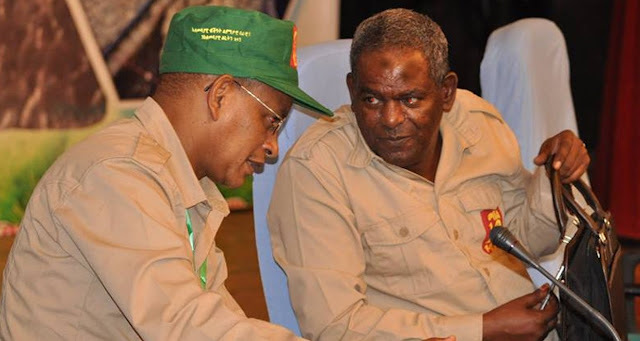 The recent propaganda by the “veteran leaders” of TPLF, Abay Tshaye and Seyum Mesfin goes back to their old political trick and ferment genocidal hate among Ethiopian people. These two are irresponsible persons to preach such hate after 25 years of ruling Ethiopians where they looted the people’s property, land, right and formed an elite upper class for themselves and their supporters. They preach doomsday saying unless TPLF rule, Ethiopia will vanish and people will be in indefinite civil war. Ethiopians are aware of their dirty tricks and those who are responsible people have a duty to teach the public to stand against this kind of hate propaganda! TPLF is irreparable. Any cosmetics will not cover its big scars. Its members have to abandon it to live in peaceful Ethiopia for themselves and their children. TPLF is like malignant cancer. The Cancer needs surgical or chemical or hormonal or combination radical treatment. The mass has to continue peaceful demonstration until TPLF kneel down to its knee. Hate politics may win the battle but not the War! May Ethiopians win the War against TPLF and move towards democratic society where everyone has equal opportunity to develop, seen equal under the face of justice and become proper citizen!